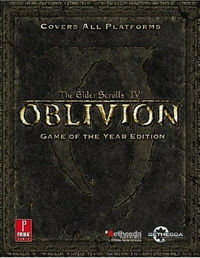 The Elder Scrolls IV: Oblivion - Official Game Guide is the official game guide for TES IV: Oblivion, written by Peter Olafson and published by Prima Games. There are three editions of the guide. Detailed maps for every part of the world and every major city, plus special maps for every key section of the main quest. Specific chapters on how to create your character and maximize your abilities and skills. 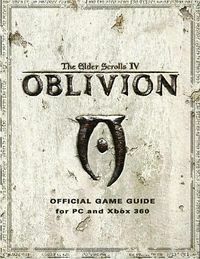 Over 300 full-color pages packed with information on everything you need to know about the massive gameworld of Oblivion. Walkthroughs for every quest in the game, including the main quest, all faction quests, as well as miscellaneous and freeform quests. Sections on various gameplay systems including stealth, combat, magic, enchanting, alchemy, and more. Detailed bestiary chapter to help you best deal with the denizens of Tamriel and Oblivion. Includes new chapters on Knights of the Nine and Oblivion downloadable content. 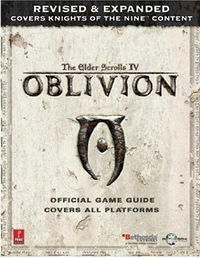 Over 450 full-color pages packed with information on everything you need to know about the massive gameworld of Oblivion. Walkthroughs for every quest in every part of the Oblivion world, including the main quest, as well as miscellaneous and freeform quests. Sections on various gameplay systems including stealth, combat, magic, spellmaking and enchanting, alchemy, and more. This page was last modified on 5 March 2019, at 09:02.